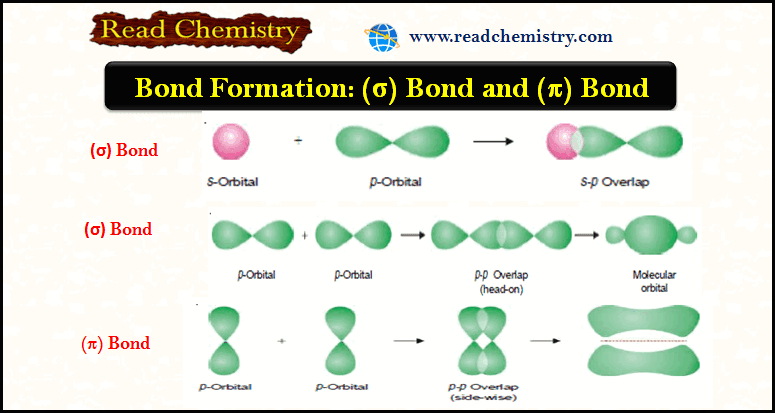 ❒ Bond formation between atoms to give chemical compounds can be interpreted admirably in terms of the orbital theory of atomic structure. ❒ Heitler and London believed that electron cloud of the valence orbital on one atom ‘overlaps’ the electron cloud of the other bonding atom to form a covalent linkage. On the contrary, the electrovalent bond formation involves a physical transfer of the electron and the orbital concept is not very useful for their explanation. The theory of ‘maximum overlap’, affords an excellent interpretation of covalent bond formation. (1) The orbitals entering into combination must have only one electron. The orbitals containing a pair of electrons are not capable of combination. In fact, half-filled orbitals on one atom have a tendency to combine with half-filled orbitals on other atom, and the resulting orbital acquires a pair of electrons of opposite spins. (2) The atoms with valence or bonding orbital (half-filled) should approach sufficiently close to one another with the axis of their orbitals in proper alignment. ❒ The strength of a covalent bond depends upon the extent of overlapping. Greater the overlapping between the atomic orbitals stronger is the bond formed between the two atoms. ❒ The new arrangement has lesser energy than the isolated atoms and, is therefore, more stable. The amount of energy given off or released per mole at the time of overlapping of atomic orbitals to form a bond is termed as Bond Energy or Stabilization Energy. It also implies that this much energy must be put in to separate the atoms in a molecule. ❒ Since the overlapping of atomic orbitals involves a release of energy, it must produce a stabilizing effect on the system. The merger or overlapping of the atomic orbitals halts at a stage when the atomic nuclei have come close enough to exercise a repulsive force on one another, which exactly balances the force of merger. This equilibrium distance at which the two atomic nuclei are now held is called the Bond length. ❒ In the bond formation, greater the overlap greater is the energy set free, i.e., the higher will be the bond strength. This implies that for a bond to be stronger, greater should be the overlap which in turn shortens the distance between the nuclei. A stronger bond has, therefore, a shorter bond length. ❒ Let us consider the formation of hydrogen molecule (H2) from two isolated H atoms each having an electron in its 1s orbital. ❒ When two H atoms approach each other, their 1s orbitals overlap, resulting in the formation of a bigger electron cloud known as molecular orbital. This new molecular orbital contains both the electrons. ❒ As the two atoms approach closer and closer for the overlap of half-filled 1s orbitals on them, the energy of the system goes on decreasing till it registers a minimum. ❒ At this point the overlapping halts, since the positive cores (nuclei) of the two atoms are apart by a certain equilibrium distance, the stabilizing effect of overlapping is completely balanced by the repulsion between the positive nuclei. Beyond this point the energy of repulsion predominates and there is a steep rise in the energy curve with a further decrease of internuclear distance. ❒ The point A in the diagram above represents a large value of internuclear distance corresponding to the two isolated atoms. By convention, the energy corresponding to this point is taken to be zero and for stabler systems, the energy of the system is negative. The energy values go on falling as the internuclear distance decreases. 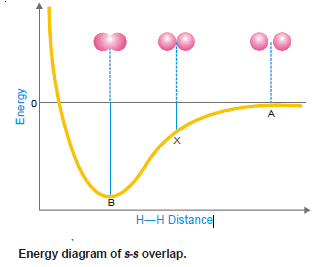 ❒ At point X on the curve, the internuclear distance decreases and so does the energy value. The minima ‘B’ represents the point of maximum overlap. ❒ The energy value and the internuclear distance corresponding to this point are respectively the bond energy and bond length. 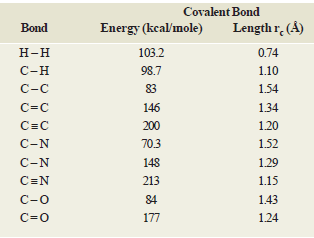 For the H2 molecule, the bond length is 0.74 Å and bond energy is 103.2 kcal/mole. ❒ When there is end to end overlapping of atomic orbitals along the internuclear axis, the bond resulted is called sigma (σ) bond. Here s-orbital of one atom overlaps with the s-orbital of other atom. An example of this type of overlapping is the formation of hydrogen molecule from two H-atoms. ❒ This type of covalent bond is formed by the sidewise overlap of the half filled atomic orbitals. It is also called lateral or sidewise overlap. ❒ As mentioned earlier, the strength of a covalent bond depends upon the extent of overlapping between the atomic orbitals of participating atoms. 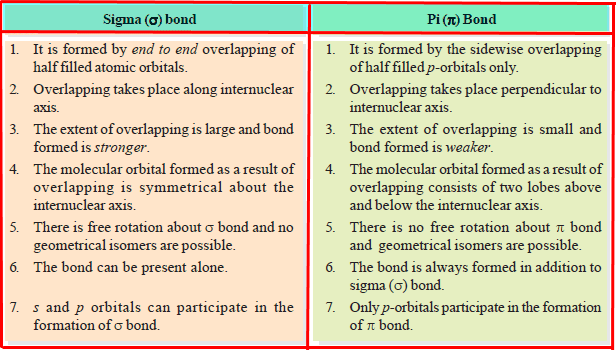 ❒ During the formation of σ bond the extent of overlapping is more and hence a Sigma bond is stronger than Pi bond.